For the most part, the UFC heavyweight belt has served as a revolving door since Mark Coleman beat fellow Hall of Famer Dan Severn to became the promotion’s inaugural champion at UFC 12 in 1997. There have been 13 different heavyweight title holders in all, not including several interim champs that were created for various reasons. Randy Couture captured the hardware on three separate occasions, the most in the division, defending it two consecutive times just once during his run. No 265-pound UFC champ has ever successfully defended their crown three straight times. 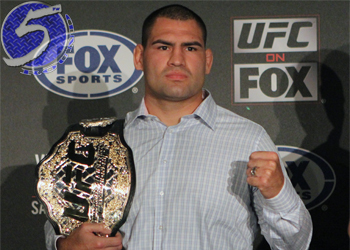 UFC president Dana White is convinced Cain Velasquez (pictured) will end the heavyweight merry-go-round and rule the throne for years to come after dominating Junior dos Santos for the second time in 10 months. “I do,” White deadpanned when asked if he thought Velasquez’s reign will be an extended one. “Leading up to this fight, I never give predictions, but what I was saying to all you guys, I was saying it to everybody, I truly think Cain Velasquez is the best heavyweight in the world. White admitted that this is the first time he’s felt this way about a UFC heavyweight champion. He always thought the belt was “up for grabs, that anybody could win it” before Velasquez convinced him differently. During Brock Lesnar’s time atop the totem pole, many believed the former WWE superstar would be the first to run the weight class for an extended period. Velasquez violently brought that train to a halt three years ago. While Lesnar’s reign turned out to be just as brief as nearly everyone else’s, he ultimately won White over by going down as the division’s most unexpected champion. “Brock came to us and was 1-0 and said, ‘I want to fight in the UFC.’ I said, ‘Dude, you’re crazy,'” White recalled. “What Brock accomplished is unbelievable. The fact that he was heavyweight champion is insane. He came in 1-0 and went on this win streak and beating guys and won the title. Velasquez now joins Couture, Andrei Arlovski, Tim Sylvia and Lesnar as the Octagon’s only heavyweight champions to defend the throne two times in a row. According to White, Fabricio Werdum is tentatively up next for Velasquez.